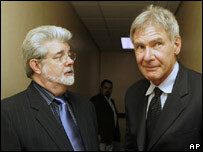 Director George Lucas says the fourth instalment in the Indiana Jones film series will start next year. Lucas said he and Steven Spielberg had recently finalised the script, and promised it was "the best one yet". Actor Harrison Ford will return as the titular star of the film, which is due to hit cinemas in May 2008. The original Indiana Jones trilogy was a tribute to Saturday morning B-movies, and made more than $1.1bn (£560m) at the box office in the 1980s. It's going to be fantastic. It's going to be the best one yet. It began in 1981 with Raiders of the Lost Ark, in which archaeologist Jones raced around the world to find the ark of the covenant before it fell into the hands of the Nazis. Written by Lucas and directed by Spielberg it saw the two kings of blockbuster cinema working together for the first time, and was a global success. The team reconvened for a sequel, Indiana Jones and the Temple of Doom, in 1984 and again for Indiana Jones and the Last Crusade in 1989. Rumours of a fourth chapter in the film saga have been circulating for several years, with each of the key participants agreeing they would only regroup if the script was good enough. Lucas, 62, has now confirmed the script is ready - after more than 10 years in development - and told the Associated Press the film was "going to be fantastic". He would not reveal any plot details, but said it would be "a character piece" including some "very interesting mysteries". At the Rome Film Festival in October, Ford announced he was "fit to play" the Jones character again. The 64-year-old actor promised he would "bring the same physical action" to a fourth movie as he did to the first three - in which he carried out many of his own stunts. Ford added that Sean Connery may return as Indiana Jones' father, Dr Henry Jones Sr. But former James Bond star Connery, who was also at the festival, said that no offer had been made.